There are more options than ever to make an outdoor kitchen a full-service living space that is both convenient and suitable for entertaining. In particular outdoor prep space suits an informal lifestyle where the host is the cook. “The same way people often cook while people sit with a glass of wine at the island inside the house, it’s nice (outside) for the host not to be excluded from all the conviviality,” said architect Anthony Barnes of Barnes Vanes Architects. Outdoor refrigerators and storage space mean less carrying back and forth from inside the home. “There’s a tendency to want to be able to prepare a complete meal outside,” Barnes said. This full-service trend is made simpler by innovations in appliances, according to Bob Berriz of Berriz Design Build Group. Where outdoor refrigerators used to need to come inside during the winter, now there are stainless steel fridges, ice machines and refrigerator drawers that can be left outside all year round. And smokers and pizza ovens mean grilling is not the only cooking option. Add proper lighting and the cooking area can be used well into the evening. Barnes said manufacturers already make grills with adjustable lights. Illumination can be added for counters and tables. Covering outdoor appliances, sinks and counters with some type of roof protects them from the elements, said Barnes. “It keeps it much cleaner, the sun’s not drying out the food, and everything lasts much longer,” he said. Barnes likes to both make the grill an architectural focal point of the outdoor area. To contain the smoke he builds it into an outdoor fireplace hearth with a chimney. 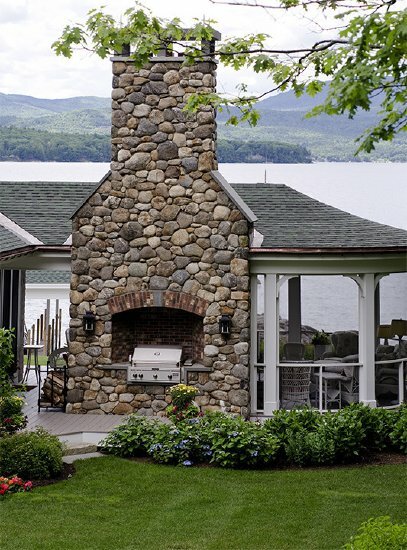 A roof over an outdoor kitchen also extends the kitchen’s usefulness into the colder months. “If it’s an outdoor covered area, one of the things we’ve been doing a lot is outdoor heaters,” Berriz said. Radiant electric heaters can be used even if it is windy, and can make the space 20 degrees to 25 degrees warmer. “There’s nothing nicer than sitting out on an outdoor covered terrace with a full kitchen and it’s raining and you’re not getting wet,” Berriz said.